This study evaluated an in-home, client-centered intensive therapy intervention to improve performance and satisfaction with daily activities, upper extremity function, and quality of life. This study included six participants with varying levels of upper extremity motor impairment. Age ranged from 23 to 77 years, and time since stroke was 8 to 92 months. The intensive therapy intervention was guided by goals identified with the Canadian Occupational Performance Measure. Therapy was conducted in participants' homes 3 to 4 hours per day, 5 days per week, for 2 weeks. Generalized least squares analysis for longitudinal data was performed with the Scheffé adjustment for pairwise comparisons. 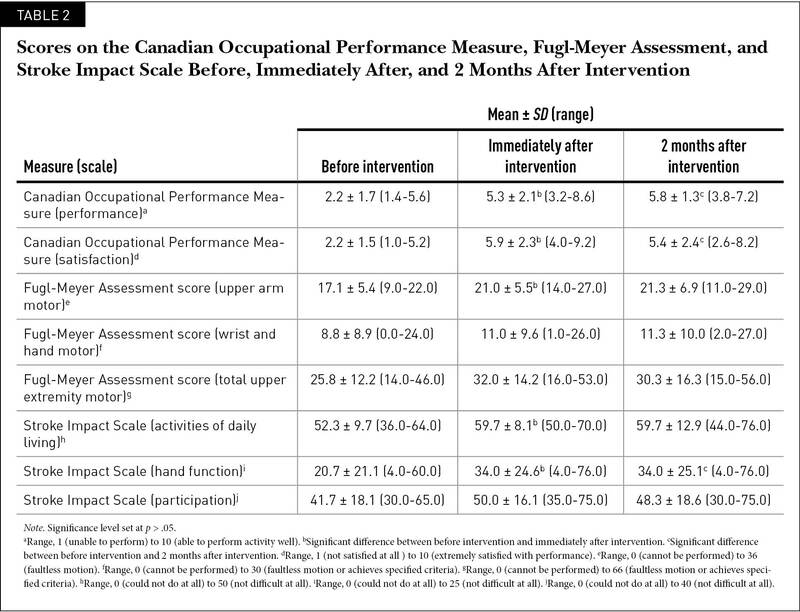 Overall, participant scores improved significantly on the Canadian Occupational Performance Measure, the Fugl-Meyer Assessment motor section, and the Stroke Impact Scale 3.0 from preintervention to immediately postintervention (p < .05). The exception was the Stroke Impact Scale hand domain. Improvements were maintained for all measures from immediately postintervention to 2-month follow-up (p < .05). Stroke is the fourth leading cause of death in the United States and a leading cause of lasting disability in adults (Centers for Disease Control and Prevention, 2014). The estimated cost of stroke each year is $36.5 billion in treatment, missed work, and medications (Centers for Disease Control and Prevention, 2014). Of survivors, 80% have hemiparesis of the upper extremity (Langhorne, Coupar, & Pollock, 2009) that can lead to limitations of activity and decreased quality of life (Haley, Roth, Kissela, Perkins, & Howard, 2011). Constraint-induced movement therapy (CIMT) is a rehabilitation approach designed to improve motor function of the upper extremity affected by a stroke. With CIMT, the unaffected upper extremity is immobilized with a sling, a mitt, or another device for approximately 90% of waking hours, and the affected upper extremity is engaged in massed and repetitive practice of selected tasks graded for level of difficulty (Kwakkel, Veerbeek, van Wegen, & Wolf, 2015; Morris, Taub, & Mark, 2006; Taub, Uswatte, & Pidikiti, 1999). The practice of CIMT has been modified (mCIMT) by eliminating the restraint (Brogårdh, Vestling, & Sjölund, 2009); altering the motor inclusion criteria (Bonifer, Anderson, & Arciniegas, 2005; Bowman et al., 2006; Taub et al., 2013); changing the format, such as group training or self-training (Brogårdh & Sjölund, 2006); and changing the environment, such as the home versus a clinic setting (Barzel et al., 2015). Other changes include decreasing the restraint time of the unaffected upper extremity, reducing the hours of practice, and increasing or decreasing the overall duration of the intervention (Page, Boe, & Levine, 2013). All of these modifications have been referred to as mCIMT (Reiss, Wolf, Hammel, McLeod, & Williams, 2012). Numerous systematic reviews have reported that CIMT and mCIMT help to improve upper extremity motor function after stroke (Corbetta, Sirtori, Castellini, Moja, & Gatti, 2015; Corbetta, Sirtori, Moja, & Gatti, 2010; Etoom et al., 2016; Kwakkel et al., 2015; Shi, Tian, Yang, & Zhao, 2011). However, CIMT and mCIMT are not routinely used in the clinical setting because of time constraints for both therapist and client (Page, Levine, Sisto, Bond, & Johnston, 2002) and exclusion of a large number of clients because of the movement criteria specified for CIMT studies (e.g., at least 10° active wrist extension, 10° active extension in two fingers) (Bonifer et al., 2005; Kwakkel et al., 2015). Several researchers have suggested that modifying mCIMT by delivering the intervention in the home environment may reduce therapy costs, decrease the need for resources, and maintain increased use of the affected upper extremity after the intervention period (Park et al., 2012). Studies of modified home-based mCIMT varied in the amount of time the intervention was delivered by a trained occupational or physical therapist and the addition of supplemental therapies during the intervention period. In two studies, the intervention was conducted solely in the home, and most of the intervention was delivered by trained caregivers or family members (Barzel et al., 2015; Tariah, Almalty, Sbeih, & Al-Oraibi, 2010). In two other studies, participants received conventional occupational and/or physical therapy in a clinic setting in addition to home CIMT delivered by a trained family member or caregiver (Azab et al., 2009) or an occupational therapist (Roberts, Vegher, Gilewski, Bender, & Riggs, 2005). These studies showed improved motor function of the affected upper extremity (Azab et al., 2009; Barzel et al., 2015; Roberts et al., 2005; Tariah et al., 2010) as well as improved functional ability (Azab et al., 2009; Roberts et al., 2005). The home environment also provides an ideal opportunity to use clients' goals as a basis for designing interventions; however, few studies have examined the effect of CIMT on self-reported satisfaction with the function of the affected upper extremity during performance of meaningful daily activities. Pierce et al. (2003) stated that the CIMT intervention included an individualized program, but did not describe how the program was individualized, how goals were identified, or how the outcome data related to achievement of the goals. A large, rigorous study of home CIMT stated that goal attainment scaling was used to set goals, but no data were reported for scores on the goal attainment scale before or immediately after the intervention (Barzel et al., 2015). Three studies (Bowman et al., 2006; McCall, McEwen, Colantonio, Streiner, & Dawson, 2011; Roberts et al., 2005) used the Canadian Occupational Performance Measure (COPM) to assess participants' perceptions of improvements in the attainment of client-identified goals. This measure was also used to guide intervention activities and evaluate the effectiveness of the intervention. All three studies found that performance and satisfaction improved from preintervention to immediately postintervention, and the authors concluded that improvements and motivation were enhanced through client-centered, occupation-based activities. In summary, CIMT and mCIMT appear to be effective in improving motor function after stroke. However, despite the difficulty of implementing CIMT in the clinic setting, few studies have examined both home-based and client-centered mCIMT. Some recent studies modified the inclusion criteria to encompass participants with moderate to severe symptoms of upper extremity motor impairment (Bonifer et al., 2005; Taub et al., 2013). Our study examined the efficacy of a home-based, client-centered intensive therapy intervention using principles from CIMT for individuals with varying levels of motor impairment of upper extremity function and performance after stroke. Participants were recruited from clients who were discharged from a large rehabilitation hospital and were no longer receiving occupational or physical therapy. Inclusion criteria consisted of the following: (a) age 21 to 80 years; (b) no serious, uncontrolled medical complications; (c) able to follow written and verbal directions and demonstrations; (d) not currently receiving skilled therapy or treatment for the affected upper extremity; (e) able to flex or abduct the shoulder to at least 45° to 50° and flex the elbow to at least 90° against gravity; and (f) independent with mobility. Potential participants were excluded from the study if they had any of the following: (a) recurrent, bilateral, or brain stem stroke; (b) major cognitive impairment; and (c) excessive spasticity and pain as determined by clinical judgment. Six participants met the study criteria. Table 1 shows their demographic information. The study was approved by the university institutional review board, and written informed consent was obtained. Participants underwent evaluation with the COPM (Law et al., 1990); the Fugl-Meyer Assessment (FMA) (Fugl-Meyer, Jääskö, Leyman, Olsson, & Steglind, 1975); and the Stroke Impact Scale 3.0 (SIS) (Duncan, Bode, Lai, & Perera, 2003). All three outcome measures were administered immediately after the final intervention session and again at 2-month follow-up. The COPM is a client-based interview in which participants identify problems with use of the affected upper extremity for self-care, productivity, and leisure activities. The top five most important performance problems are identified, and participants rate their level of performance from 1 (unable to perform the activity) to 10 (able to perform the activity well) and their level of satisfaction from 1 (not satisfied at all) to 10 (extremely satisfied with performance) (Law et al., 1990). Performance scores and satisfaction scores for the top five problems are summed respectively and divided by 5 to yield mean scores for performance and satisfaction. The COPM is reliable and valid in adults after stroke (Cup, Scholte op Reimer, Thijssen, & van Kuyk-Minis, 2003). A change is considered clinically significant if there is a difference of 2 or more points between scores (Law et al., 1994). We used the COPM with each participant to establish goals for the intervention plans. The FMA measures sensory and motor function after stroke (Fugl-Meyer et al., 1975). Domains for the upper extremity include passive joint range of motion (24 points), pain (24 points), sensation (12 points), and total motor function (66 points), for a maximum score of 126 points. Joint motion, pain, and sensation (light touch and proprioception) are measured on a 3-point scale from 0 (a few degrees of joint motion/marked pain/anesthesia) to 2 (normal passive joint motion/no pain/normal sensation). Motor function is rated on a 3-point ordinal scale from 0 (cannot perform the activity) to 2 (able to fully perform the activity). For our study, upper extremity motor function scores were used as outcome measures. We used the scores for passive joint motion, pain, and sensation to describe the sample. Studies have shown the FMA to have high test-retest and interrater reliability as well as construct validity (Duncan, Probst, & Nelson, 1983; Hsieh et al., 2009). A change in the upper extremity score of 4.25 to 7.25 points is considered clinically significant (Page, Fulk, & Boyne, 2012). The SIS is an outcome measure that evaluates the effect of stroke across eight domains: strength, hand function, activities of daily living and instrumental activities of daily living (ADL/IADL), mobility, communication, emotion, memory and thinking, and participation (Duncan et al., 2003). Items are rated on a scale of 5 (not difficult at all) to 1 (extremely difficult), and scores for each item are summed to yield a domain score (Duncan et al., 1999). We used only the domains of ADL/IADL, hand function, and participation. The SIS has been shown to have high inter-rater reliability as well as concurrent and construct validity (Lin et al., 2010a; Vellone et al., 2015). A change of 5.9 points for ADL/IADL and a change of 17.8 points for hand function have been shown to be clinically significant (Lin et al., 2010b). A clinically significant change in the score for participation has not been established. The intervention plan for all participants was designed and initiated by a licensed occupational therapist with expertise in neurorehabilitation (S.L.S.). 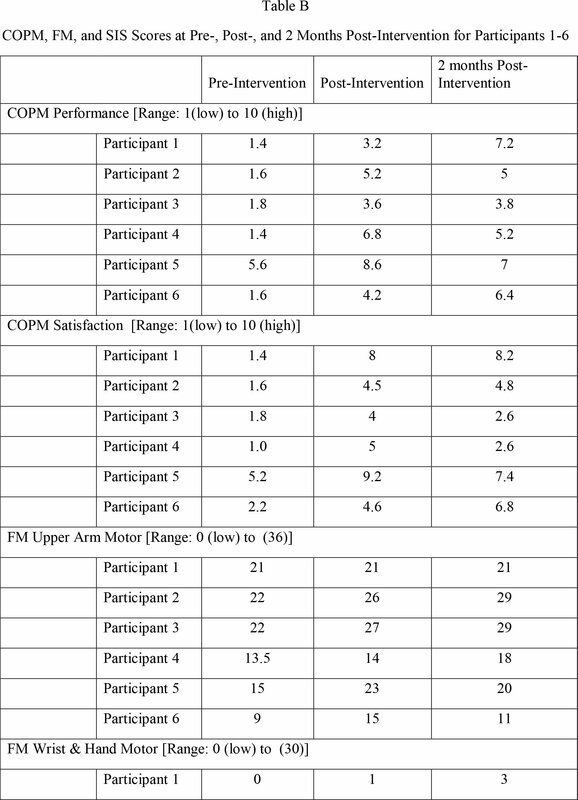 Interventions were based on each participant's self-identified goals on the COPM (Table A, available in the online version of the article) and current joint motion and motor abilities of the affected upper extremity. Activities included shaping, repetitive practice, and compensatory techniques and were graded for difficulty by varying the weight of objects, increasing the distance to complete activities, varying the use of seated and standing positions while performing activities, and increasing the number of repetitions and sets of activities. Examples of activity grading used in this study included altering the weight of an object (e.g., foam vs. plastic baseball bat) and varying the diameter of containers during a gross grasp activity (e.g., spice jar vs. peanut butter jar). Compensations included using suction cup cutting boards, built-up handles, and loops on drawer and refrigerator handles. Activity logs tracking daily intervention activities were completed by the interventionists during each session. After each intervention session, participants were asked to continue using the affected upper extremity to complete activities on their own until the next session. Participants were asked to give verbal accounts of their independent task practice at the start of each session to monitor compliance. Intervention sessions were 3 to 4 hours long and were held 5 days a week for 2 weeks, based on protocols used by Roberts et al. (2005), Stevenson and Thalman (2007), and Brogårdh et al. (2009). Interventions were delivered in participants' homes by a pair of trained occupational therapy students under the supervision of a licensed occupational therapist (S.L.S.). Generalized least squares analysis for longitudinal data with the Scheffé adjustment for pairwise comparisons was used to test pairwise comparisons of outcomes from before the intervention and immediately after the intervention, immediately after the intervention and at 2-month follow-up, and before the intervention and at 2-month follow-up. Analysis was performed with STATA, version 14.2. Table 2 shows the descriptive statistics for all of the outcome measures at three points in time: before the intervention, immediately after the intervention, and at 2-month follow-up. Figure 1 shows visual representations of each of the six participants' scores (P1-P6) at the three points in time. 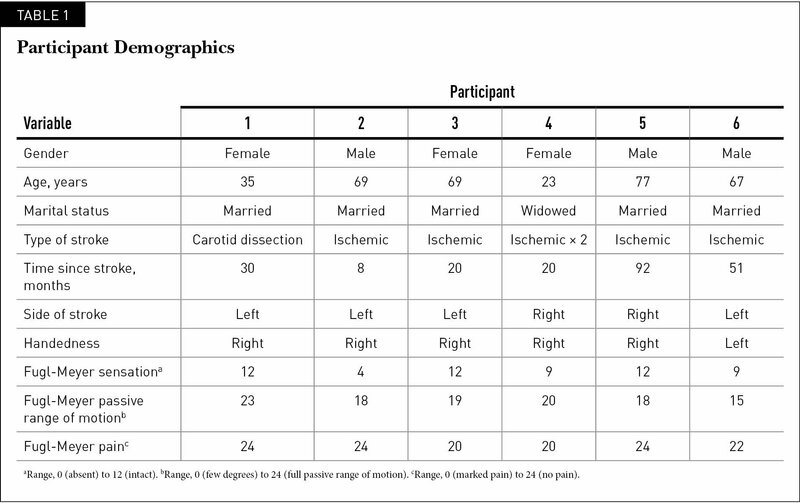 Table B, available in the online version of the article, shows the scores for the individual participants on each of the outcomes before and after the intervention and at 2-month follow-up. Wilcoxon nonparametric tests were used for pairwise comparisons of outcomes from before and immediately after the intervention, immediately after the intervention and at 2-month follow-up, and before the intervention and at 2-month follow-up. Canadian Occupational Performance Measure total performance scores for participants 1 through 6 (A). Canadian Occupational Performance Measure total satisfaction scores for participants 1 through 6 (B). For COPM scores, significant improvements were noted from preintervention to postintervention for both performance (p < .01) and satisfaction (p < .01) and also between preintervention and 2-month follow-up (p < .01 for performance; p < .01 for satisfaction). However, no significant changes were noted from immediately postintervention to 2-month follow-up (p = .71 for performance; p = .93 for satisfaction). Figure 2 shows the scores on the FMA. Overall, motor function of the affected upper extremity, as measured by the FMA, improved from preintervention to postintervention, but the change was not significant (p = .31). In addition, no significant change was noted from immediately postintervention to 2-month follow-up (p = .94) or from preintervention to 2-month follow-up (p = .17). For FMA upper arm scores, significant changes were noted between preintervention and postintervention (p = .05), but no significant changes were seen between postintervention and 2-month follow-up (p = .84) or between preintervention and 2-month follow-up (p = .17). 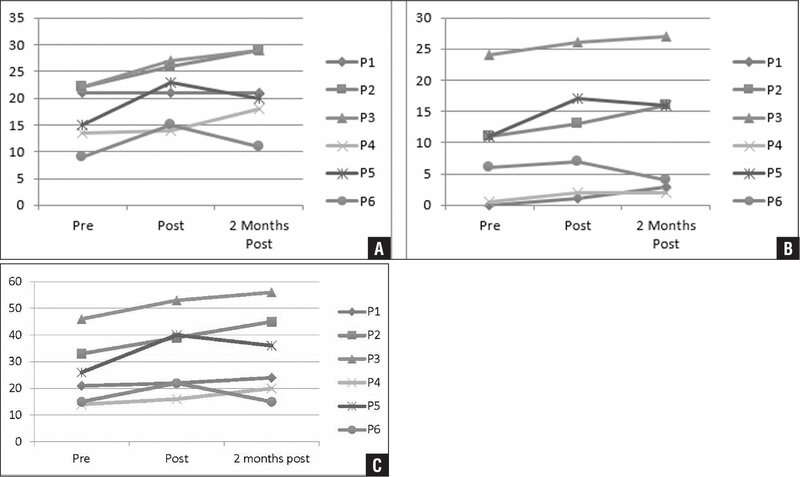 For FMA wrist and hand scores, no significant differences were noted between preintervention and immediately postintervention (p = .69), postintervention and 2-month follow-up (p = .97), or preintervention and 2-month follow-up (p = .55). Fugl-Meyer upper arm motor scores for participants 1 through 6 (A). Fugl-Meyer wrist and hand motor scores for participants 1 through 6 (B). 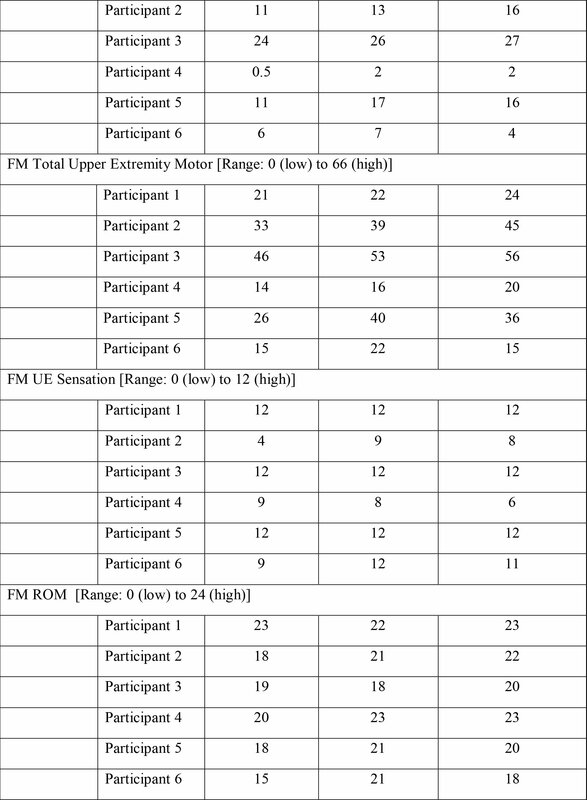 Fugl-Meyer total upper extremity motor scores for participants 1 through 6 (C). 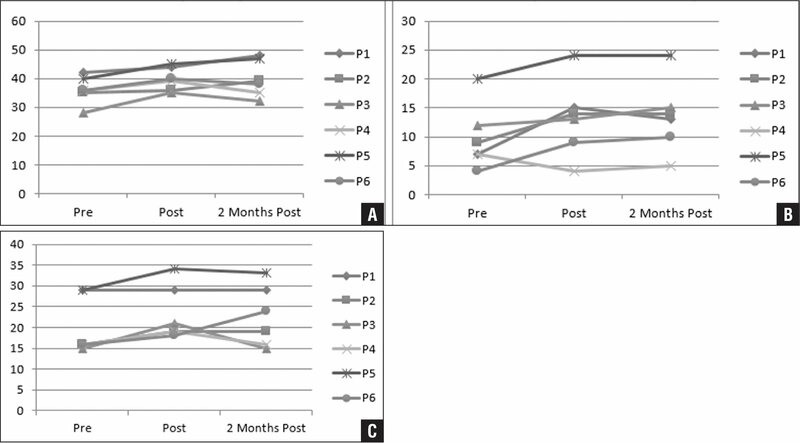 On the SIS, significant improvements were noted for scores in the ADL/IADL domain (Figure 3A) from pre-intervention to postintervention (p = .02), but no significant differences were found from postintervention to 2-month follow-up (p = .60) or between preintervention and 2-month follow-up (p = .21). For the SIS hand domain (Figure 3B), significant improvements were found between preintervention and postintervention scores (p < .001) and between scores obtained before the intervention and at 2-month follow-up (p < .001) but not between postintervention scores and those obtained at 2-month follow-up (p = .95). For the SIS participation domain (Figure 3C), no significant differences were noted between preintervention and postintervention scores (p = .69), between scores obtained immediately after the intervention and at 2-month follow-up (p = .97), or between preintervention scores and those obtained at 2-month follow-up (p = .55). Stroke Impact Scale 3.0 activities of daily living scores for participants 1 through 6 (A). 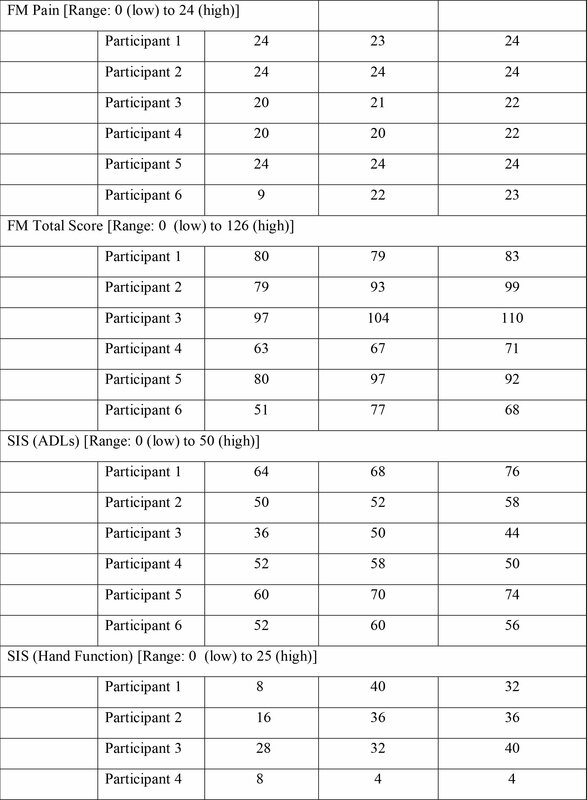 Stroke Impact Scale hand function scores for participants 1 through 6 (B). 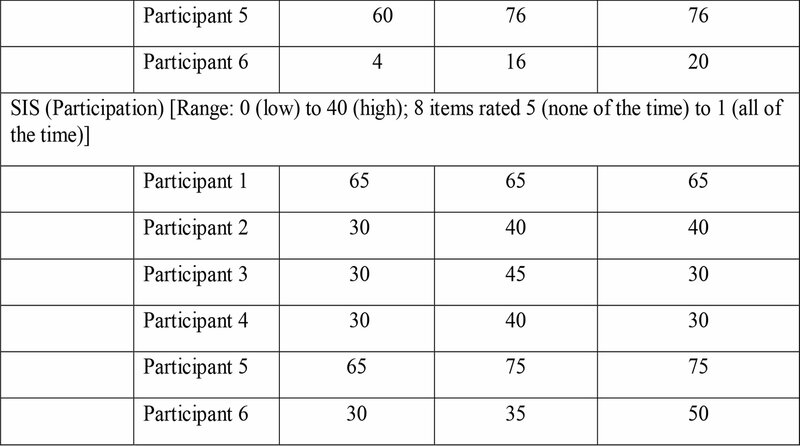 Stroke Impact Scale participation scores for participants 1 through 6 (C). This study evaluated a home-based, client-centered intensive mCIMT intervention. The significant increase in COPM scores from preintervention to immediately postintervention suggests that the intervention was effective in improving the perception of performance and satisfaction with client-identified goals on the COPM. Although some participants showed slight decreases in scores at follow-up, no significant differences occurred, suggesting that improvements were maintained. Findings were similar for FMA upper arm scores in that motor function improved significantly postintervention. However, despite the finding of little to no change, one participant's perception of her performance on the COPM increased by 5 points (Figure 1). A possible explanation for this finding is that the participant learned compensatory strategies during the intervention that helped her to feel more confident in performing meaningful activities. Our findings on changes in motor function are similar to those of previous studies that showed increases in FMA scores after intervention (Page, Dunning, Hermann, Leonard, & Levine, 2011; Page et al., 2013; Peurala et al., 2012; Shi et al., 2011; Sirtori, Corbetta, Moja, & Gatti, 2009). The decreases in COPM and FMA scores from postintervention to follow-up are similar to the findings of Roberts et al. (2005), who reported lower scores at 6-month follow-up compared with immediately after the intervention. Roberts et al. (2005) suggested that participants may have been disappointed that they did not continue to see improvements as quickly as during the initial intervention and concluded that it was unlikely that the participants practiced at the same intensity during the follow-up period as they had during the intervention. Participants admitted that they had not practiced as much without the student interventionists and reported that having the interventionists in the home provided supervision, socialization, encouragement, and motivation that they did not have in the follow-up period. Improvements in scores for the SIS ADL/IADL and participation domains could be the result of increased use of the affected upper extremity and increased COPM satisfaction scores. However, improvements were not significant for the participation domain, and some participants did not maintain improvements for both domains. The decreases in scores could be the result of decreasing practice and lack of encouragement by the interventionists, but the nonsignificant differences in scores immediately after the intervention and at 2-month follow-up suggest that the improvements were maintained. Only the SIS hand domain showed significant improvement postintervention, and the scores at 2-month follow-up were significantly higher than those obtained before the intervention. Our study and others showed that gains can decrease after intervention, and future studies could explore strategies to maintain or continue gains. When family members were trained to use concepts of CIMT to help with the intervention, improvements continued from postintervention to follow-up, which ranged from 4 to 6 months (Azab et al., 2009; Barzel et al., 2009; Tariah et al., 2010). These results suggest that training family members could play a key role in maintaining performance improvements for mCIMT protocols. This study had several limitations. First, the results are based on a very small sample of individuals with hemiparesis after stroke; therefore, the findings cannot be generalized to all individuals after stroke. Second, the participants had varying degrees of upper extremity motor function as well as individualized goals. These differences affected not only the approach to intervention taken with each participant but also the trajectory of results observed for each individual. We did not measure muscle tone, which could have affected the outcomes. A larger sample size would have allowed us to assess changes over time for the various outcome measures and to perform subgroup analyses for the wide range of motor abilities. This study also did not use a control group for comparison. Future research on the effectiveness of in-home, client-based intensive therapy should include larger sample sizes and a control group. Finally, although different pairs of students provided the interventions, because of consistencies across all interventions, including the supervising therapist who designed the interventions, the principles of shaping, the repetitive practice, and the detailed diaries of activities, this delivery format could be replicated in future studies. A unique feature of our study was that the intervention was delivered in the home environment by trained second-year occupational therapy graduate students under the supervision of a licensed occupational therapist. The intervention was 3 to 4 hours long and focused on activities that used adaptations or compensations as needed to achieve client-identified goals. Previous studies showed that training family members or caregivers was effective for the delivery of CIMT (Azab et al., 2009; Barzel et al., 2009; Tariah et al., 2010). Similarly, the use of occupational therapy students to deliver the intervention may be a cost-effective approach. Further research could investigate the provision of “booster” training sessions over a longer follow-up period to increase real-world learning and transfer. A potential area for study is whether certain numbers or years of booster sessions of mCIMT would maintain gains in upper extremity function or use. We also had less stringent inclusion criteria than most studies of mCIMT or CIMT. These criteria required active motion of the shoulder and elbow and at least 10° wrist extension and at least 10° metacarpophalangeal extension in at least two fingers. However, even the three participants in our study who had very little finger movement showed improvement in performance, satisfaction with the achievement of client-identified goals, and very minimal improvements in motor function. These improvements are similar to those seen in the few studies of mCIMT in participants with limited function (Taub et al., 2013). This study showed that intensive practice of the affected upper extremity can be performed in the home environment. The use of trained occupational therapy students can be a cost-effective way to deliver interventions and provide additional supervised practice time. In addition to changes in motor function of the affected upper extremity, participants' perceptions of performance and satisfaction with the use of the upper extremity showed improvement immediately after the intervention and at follow-up. Greater gains occurred immediately postintervention compared with 2 months later, but scores remained higher than at baseline. The in-home, client-centered intervention may have improved client motivation because the intervention focused on goals that were meaningful to participants. Gains may be maintained because therapy took place in each client's natural environment (Stevenson & Thalman, 2007). To help individuals to maintain gains after the intervention period, future studies could assess the effectiveness of calendars, checklists, applications, and telephone reminders to motivate and remind individuals to use the affected upper extremity when performing daily activities. These strategies could aid in carryover of progress made during the intervention period because meaningful gains may continue to improve daily life and satisfaction after stroke. Bowman, M. H., Taub, E., Uswatte, G., Delgado, A., Bryson, C., Morris, D. M. & Mark, V. W. (2006). A treatment for a chronic stroke patient with a plegic hand combining CI therapy with conventional rehabilitation procedures: Case report. NeuroRehabilitation, 21(2), 167–176. Corbetta, D., Sirtori, V., Moja, L. & Gatti, R. (2010). Constraint-induced movement therapy in stroke patients: Systematic review and meta-analysis. European Journal of Physical and Rehabilitation Medicine, 46(4), 537–544. Fugl-Meyer, A. R., Jääskö, L., Leyman, I., Olsson, S. & Steglind, S. (1975). The post stroke hemiplegic patient: I. A method for evaluation of physical performance. Scandinavian Journal of Rehabilitation Medicine, 7(1), 13–31. Morris, D. M., Taub, E. & Mark, V. W. (2006). Constraint-induced movement therapy: Characterizing the intervention protocol. Europa Medicophysica, 42(3), 257–268. Taub, E., Uswatte, G. & Pidikiti, R. (1999). Constraint-induced movement therapy: A new family of techniques with broad application to physical rehabilitation. A clinical review. Journal of Rehabilitation Research and Development, 36(3), 237–251. Participant 3 To use her affected UE to drive to cut her food to hold a broom/mop/vacuum to swim to type. Participant 5 To use his affected UE to bathe his RUE and apply deodorant to his RUE to hold a book/magazine to hold/stabilize food to cut and slide food to move objects from place to place on the counter to hold/carry objects such as plates. Dr. Poole is Professor and Director, Occupational Therapy Graduate Program, School of Medicine, University of New Mexico, Albuquerque, New Mexico. Ms. Carbajal is Occupational Therapist, Sandoval Regional Medical Center, Rio Rancho, New Mexico. Ms. Cole is Occupational Therapist, Lovelace Inpatient Rehab Hospital, Albuquerque, New Mexico. Ms. Ginther is Occupational Therapist, VA Medical Center, Albuquerque, New Mexico. Ms. Streng is Occupational Therapist, New Mexico Orthopaedics, Albuquerque, New Mexico. Mr. Quinlan is Occupational Therapist, Rehabilitation Hospital of Southern New Mexico, Las Cruces, New Mexico. Ms. Rouw is Occupational Therapist, VA Home Based Primary Care, Ottumwa, Iowa. Dr. Singleton is Occupational Therapist, Lovelace Rehabilitation Hospital, Albuquerque, New Mexico. Dr. Skipper is Professor, Family & Community Medicine, University of New Mexico, Albuquerque, New Mexico. Address correspondence to Janet L. Poole, PhD, OTR/L, FAOTA, Professor and Director, Occupational Therapy Graduate Program, School of Medicine, University of New Mexico, 1 University of New Mexico, MSC09 5240, Albuquerque, NM 87131-0001; e-mail: jpoole@salud.unm.edu.